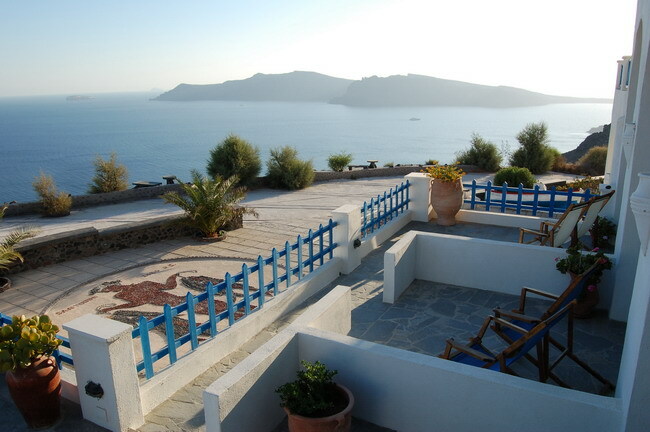 Perched on a hillside in Pyrgos village, Voreina features uniquely decorated suites with artwork pieces, boasting spectacular sunset views over the Aegean Sea. 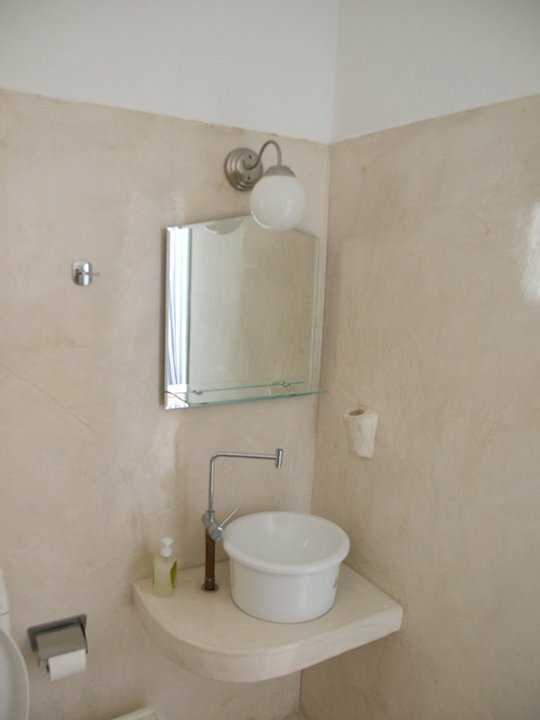 All suites come with jacuzzi, while some have private pools.Voreina Galley Suites are designed in keeping with the Cycladic architectural style. 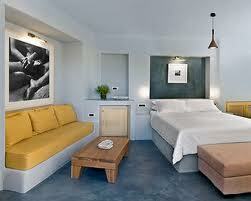 Each features paintings and sculptures and is decorated in bright earthy tones. 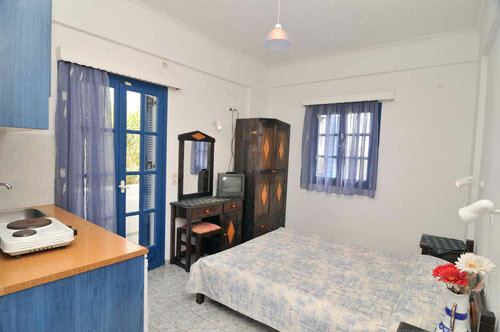 Facilities include a satellite LCD TV, iPod docking station and air conditioning. 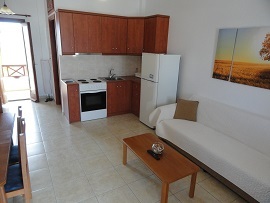 Some units also include a fully equipped kitchen and fireplace. 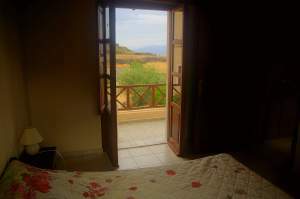 Guests can have a rich breakfast with fresh bread and homemade delicacies in the privacy of their room's terrace enjoying panoramic views of Santorini. 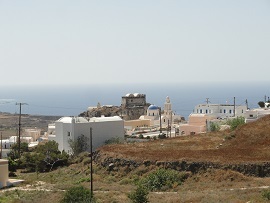 Fira, the capital of Santorini, is 5 km away. 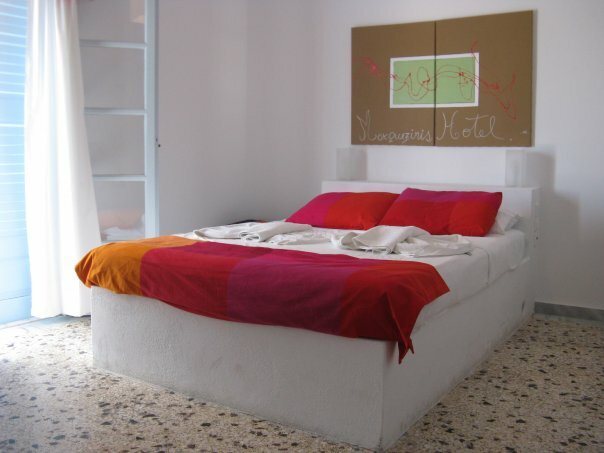 The hotel's staff offers free 2-way transfer to the port and airport of the island, as well as the main tourist destinations. Free Wi-Fi and on-site parking are available. 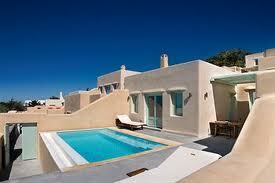 FOR MORE HOTELS, APARTMENTS AND STUDIOS ON SANTORINI - CLICK HERE. 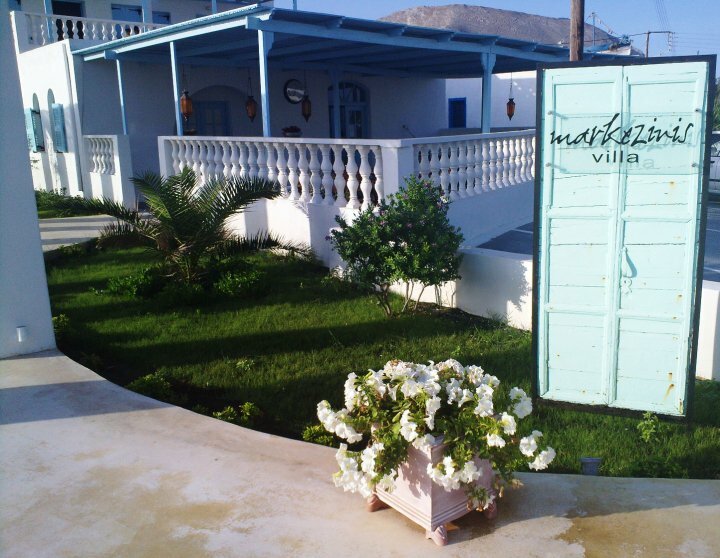 Villa Markezinis is located in one of the most popular spots of Santorini, Perivolos black sandy beach. 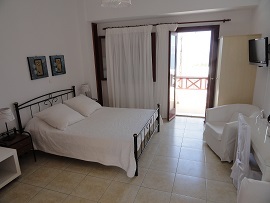 You will find a quite, chill-out and friendly atmosphere where you can combine the cosmopolitan style of our guests with the service and hospitality of a young Greek owner, and just 150m away from the beach in countryside surroundings. 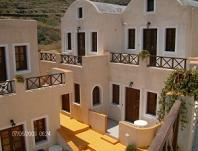 Santorini Hotels - William's Houses in Akrotiri - very good and not expensive! 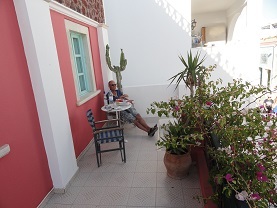 Here we stayed in May 2013, William's Houses in Akrotiri. 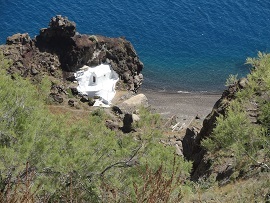 Something different than Oia or Fira, which are the most touristic spots of the island. Here you are away from the crowds. 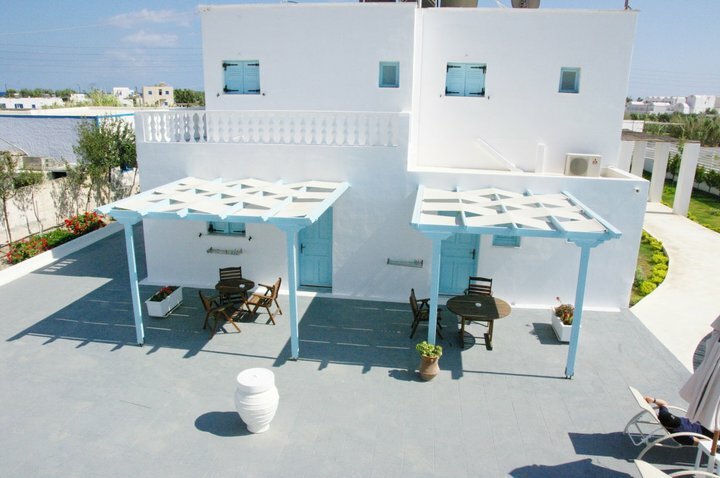 Akrotiri is located in the south of Santorini. 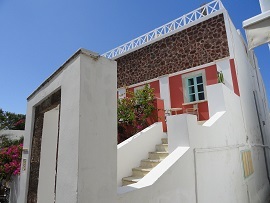 William's Houses is two kilometers away from the famous "Red Beach" and you can also climb down to a few small beaches. 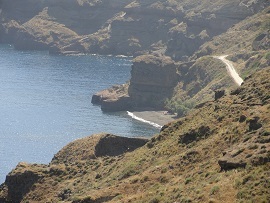 Along a path from the road A few 100 meters away lies the path to Caldera Beach. 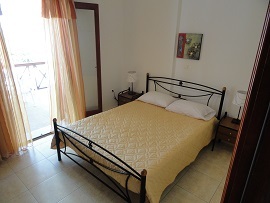 The welcome was very warm, the rooms were beautiful and elegantly furnished. 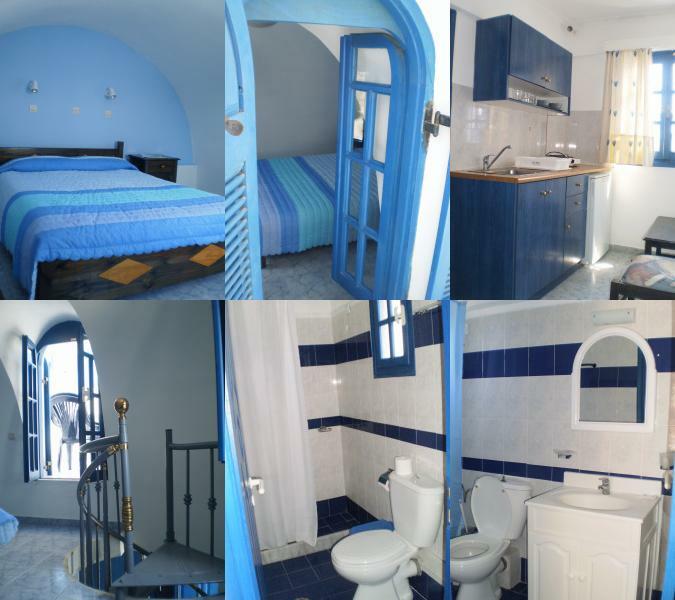 Friends of ours were in a studio, we had booked a two bedroom apartment for ourselves. 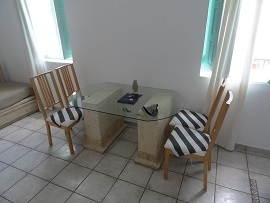 There are also maisonettes. 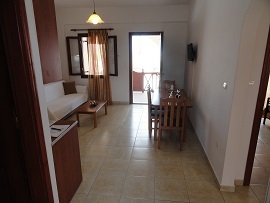 Our apartment had a large balcony with sea view and it was fully equipped. 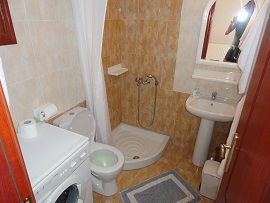 There was even a washing machine. We were given a daily list that we could fill out telling them what we wanted for breakfast, and at what time. In the morning it was than placed on our terrace. 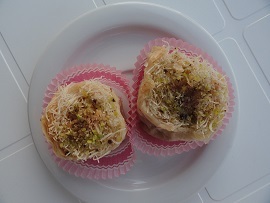 Next to William's Houses is a good restaurant and a 1-minute walk away is another one. Next to this restaurant is also the path down which leads to two small beaches and a church. 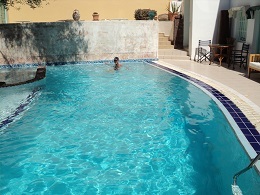 Here we stayed a few days in May 2013, the Best Western The Museum Spa Wellness Hotel. 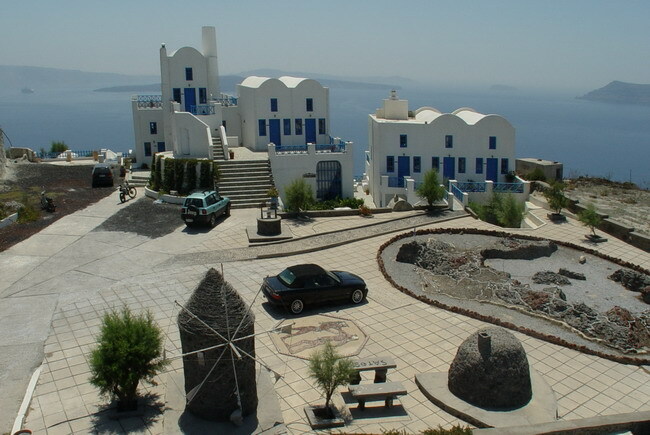 It is situated in the pedestrianized center of Oia on the "main road". 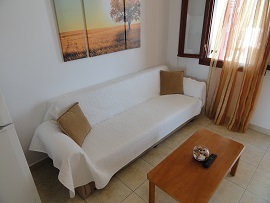 We had a two-room apartment here with a living room with two sofa beds and a kitchen, and a separate master bedroom. 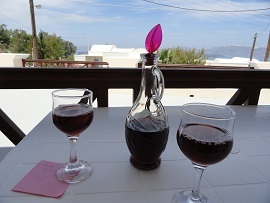 On the terrace outside there were seats where you could watch people walk by while sipping a glass of wine. Behind the hotel was a nice large pool. The breakfast buffet was very good and you could have it either in the breakfast room or behind the hotel at the pool area. Both from the front of the building of William's Houses as from the back (as we had an extra balcony) you can see the sea. 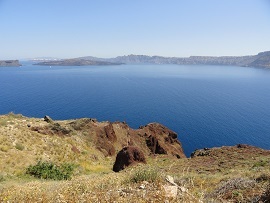 At the front is the caldera and at the back you can see the village of Akrotiri with its castle and churches and beyond the sea. 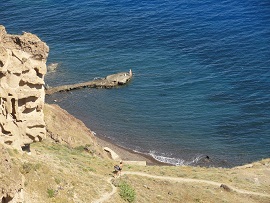 In the vicinity are several footpaths that go to different small beaches. 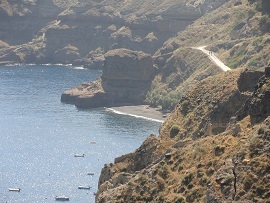 You can get to Caldera Beach by car. They are all very quiet. 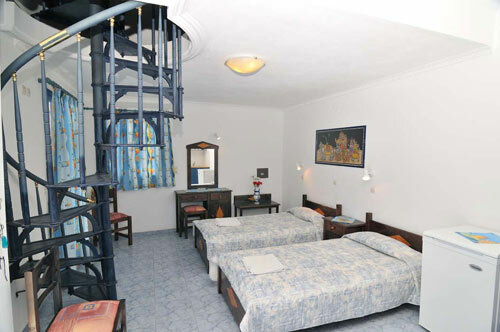 Situated just 150 metres from the centre of Perissa, San Efrem hotel offers self-catering rooms with balcony. 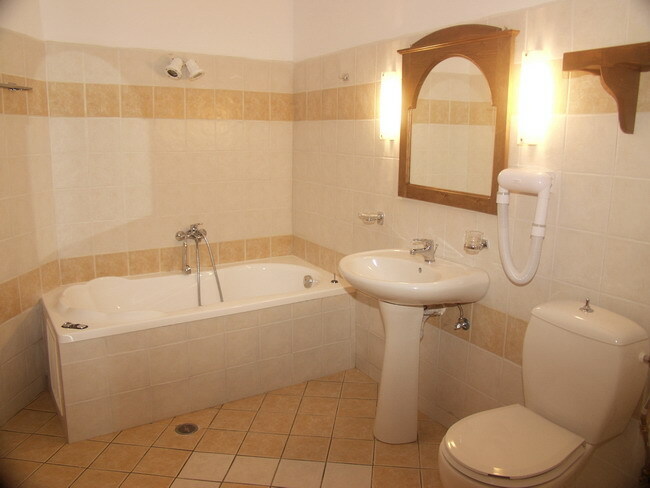 It has a large swimming pool and provides free private on-site parking. 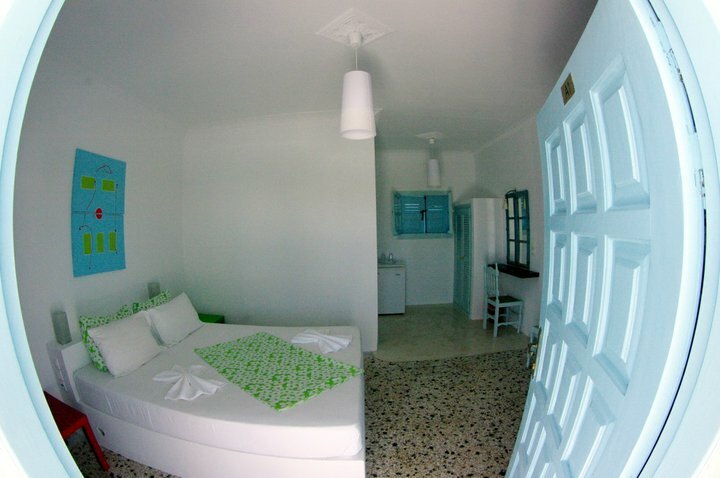 San Efrem studios and apartments are simply, yet traditionally decorated according to the Cycladic style. 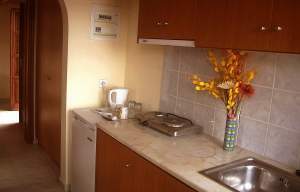 They all include a kitchenette with refrigerator, while the apartments also have a dining area. Air conditioning is available at an extra charge. 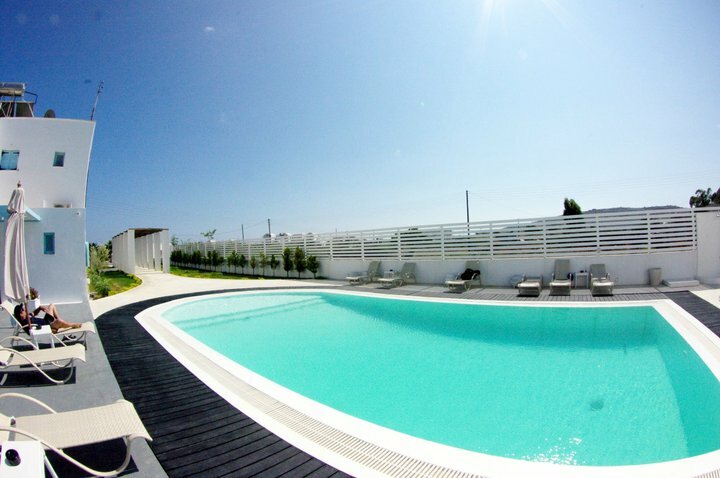 The swimming pool area features a sun terrace with sun beds and umbrellas surrounded by trees. 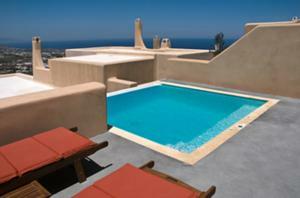 The pool bar of San Efrem serves snacks and refreshing beverages. 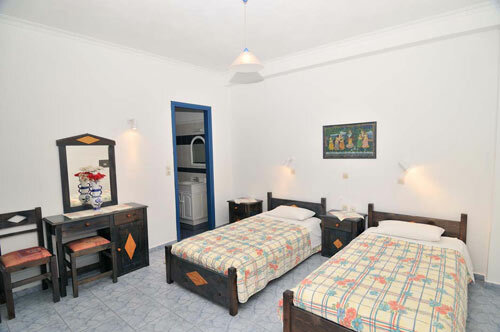 Hotel San Efrem is 200 metres away from the popular beach of Perissa. 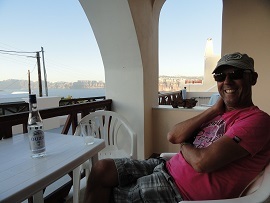 The airport of Santorini is at 15 km. Free wired Internet is available in the hotel's public areas. 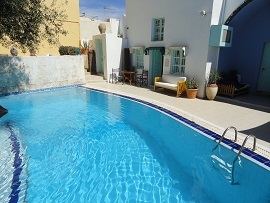 Soulis Apartments, found in the picturesque village of Oia, merely 100 metres from the beach of Kouloumpos, combine modern comforts with privileged location all year round. 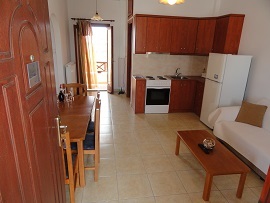 The complex consists of 20 newly built traditional apartments. 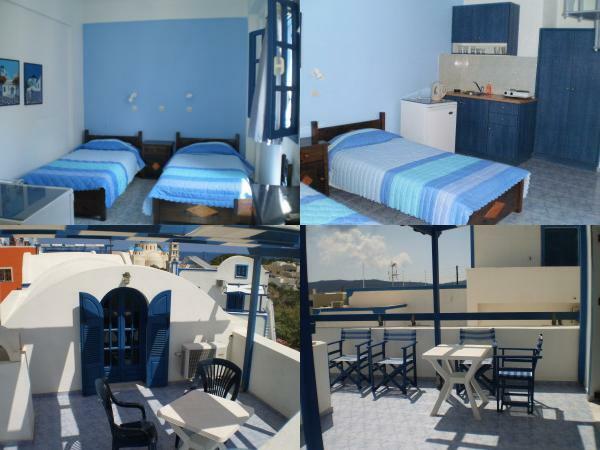 Each features air-condition, fully equipped kitchen with a refrigerator, TV and balcony with view to the sea and the famous sunset. 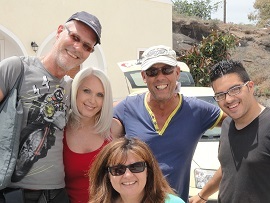 Soulis Apartments provide guests with free shuttle service to the port and the airport as well as free transfers to and from Oia. 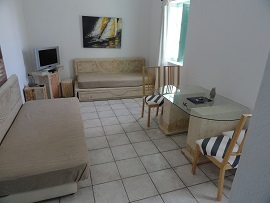 Guests may also benefit from the free wireless internet connection available in the entire hotel. 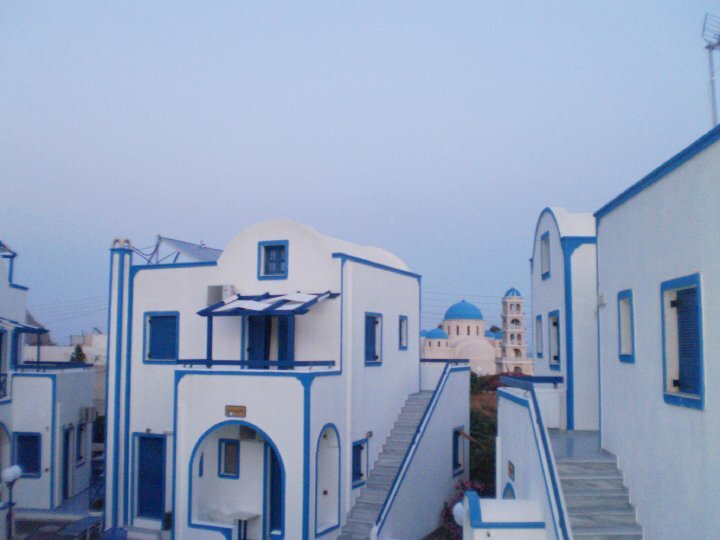 Around the traditional settlement of Oia there are beautiful beaches with clear blue water, among which are Armeni, Amoudi, Kouloumpos, Baxedes and Ori. 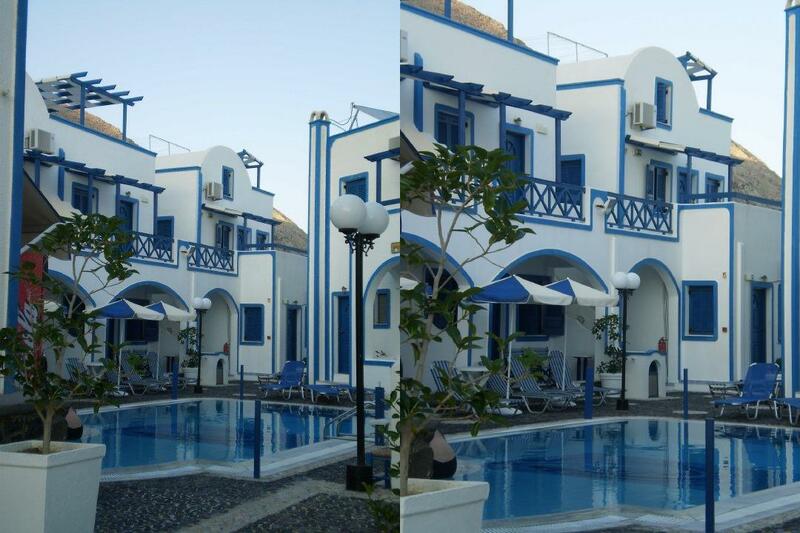 Note: the description says that the hotel is situated in Oia, but it is really just outside (why else would there be free transfers to and from Oia? 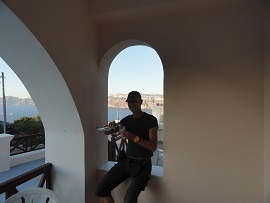 Understandably: Oia has the magical sound). This is a place that I would choose myself. 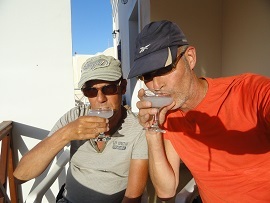 It is very quiet and the beach is absolutely fabulous: a quiet and large sandy beach that is surrounded by a high cliff. 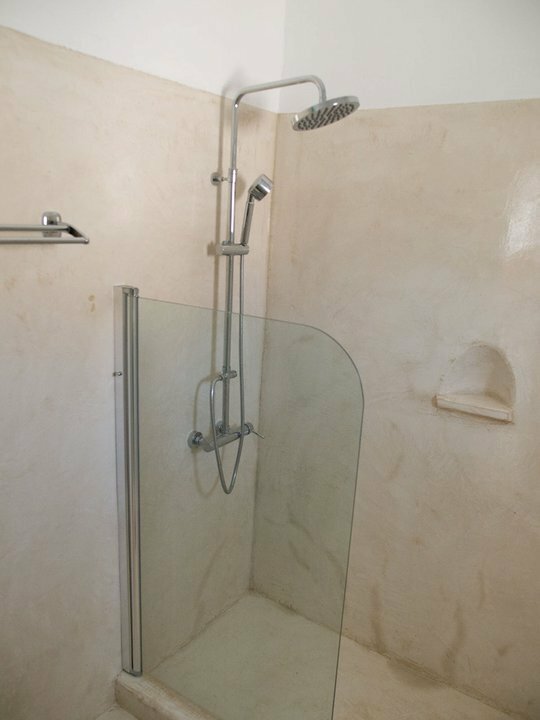 It is also suitable for naturists! On this side of the island you have the beautiful sunsets that you can enjoy in peace and quiet. 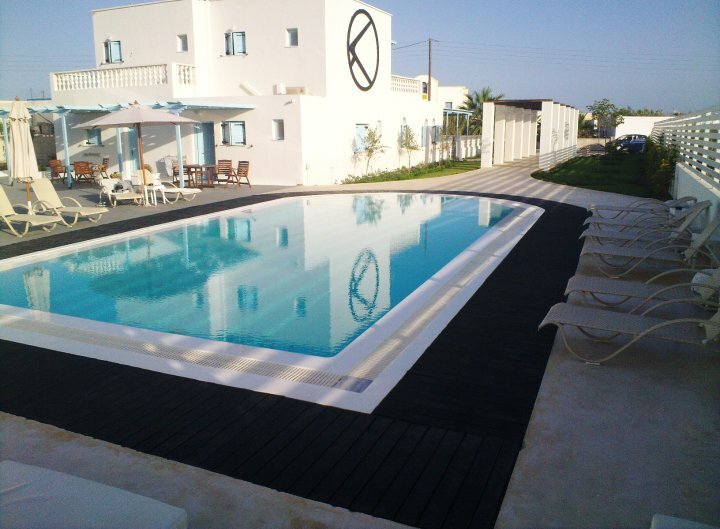 Roulla Villa, situated just a short walk from Perissa Beach, offers a large outdoor pool with Jacuzzi facilities and weekly Greek theme nights. 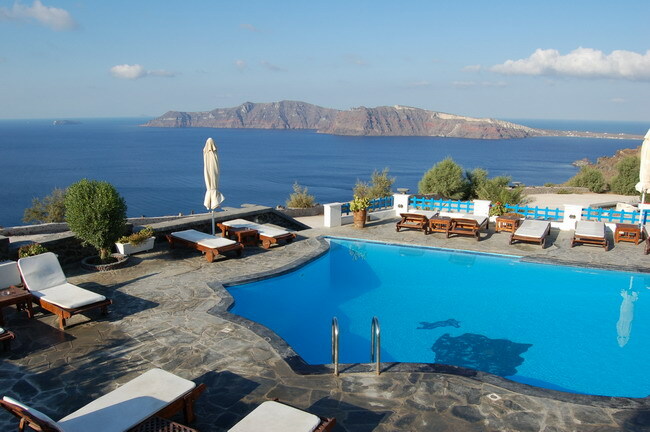 This family-run hotel is designed in the traditional style of Santorini. 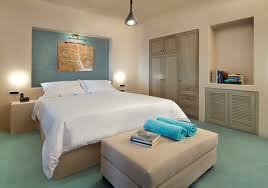 Each of its comfortable rooms features en-suite bathroom and a fully equipped kitchen. 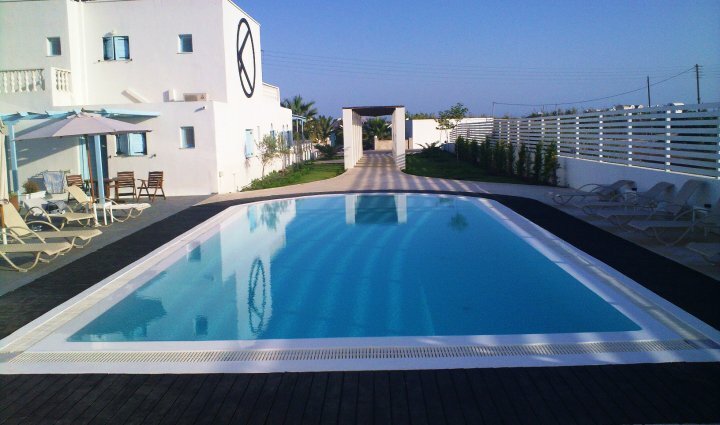 Guests can choose to stay at Roulla Villa and enjoy a refreshing swim at the pool or walk to the nearby Perissa Beach. 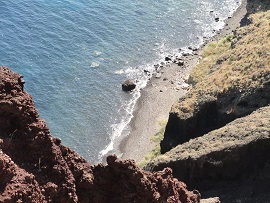 The 7-kilometres long beach, featuring black sand, is one of Santorini's most impressive beaches. 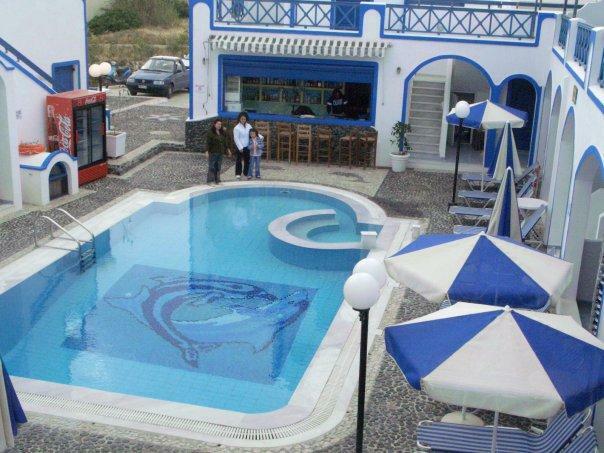 At the pool bar area guests can relax with a drink while enjoying the Mediterranean sun or join in with the fun and dancing at Roulla's popular Greek night. 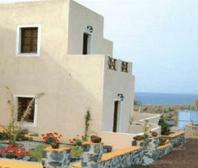 Roulla Villa provides rental services, for those wishing to further explore the island of Santorini. 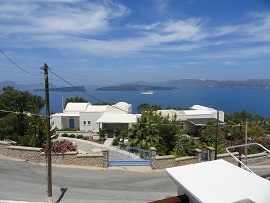 There is also a local bus stop just 50 metres from the hotel with frequent buses connecting with the other parts of the island. 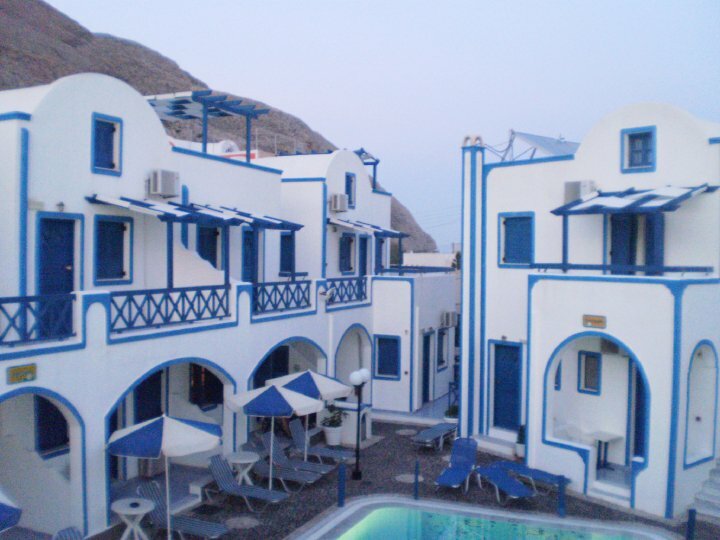 The 4**** Atlantida Villas complex is located in the village of Oia (Ia) on the cliff side of the island of Santorini. 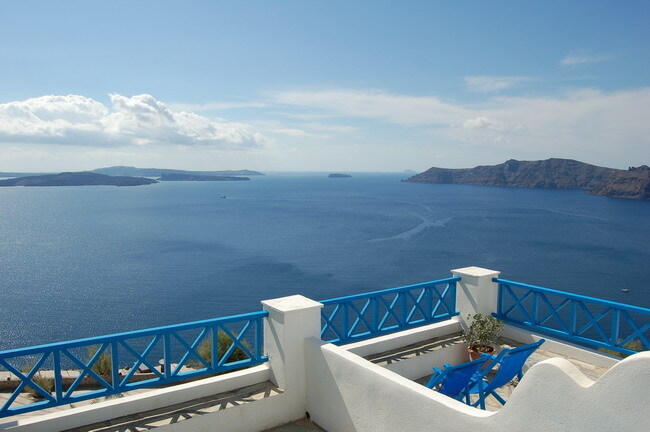 All the suites, apartments, studios and double rooms have their own balcony or veranda overlooking the volcano, the sea and the cliffs of the village of Oia in Santorini. 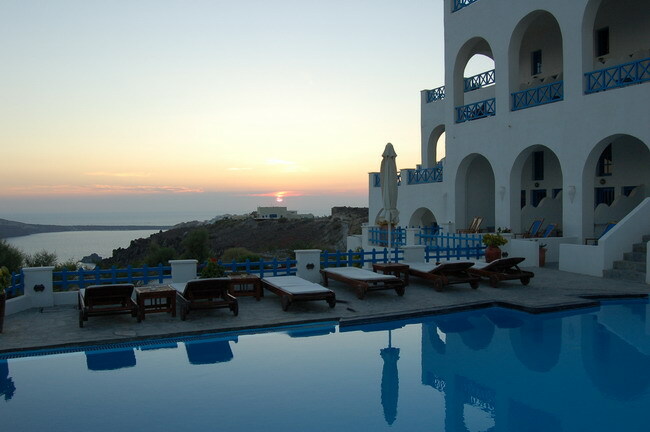 The guests can enjoy the magnificent sunsets for which Santorini, and especially Oia, is famous. 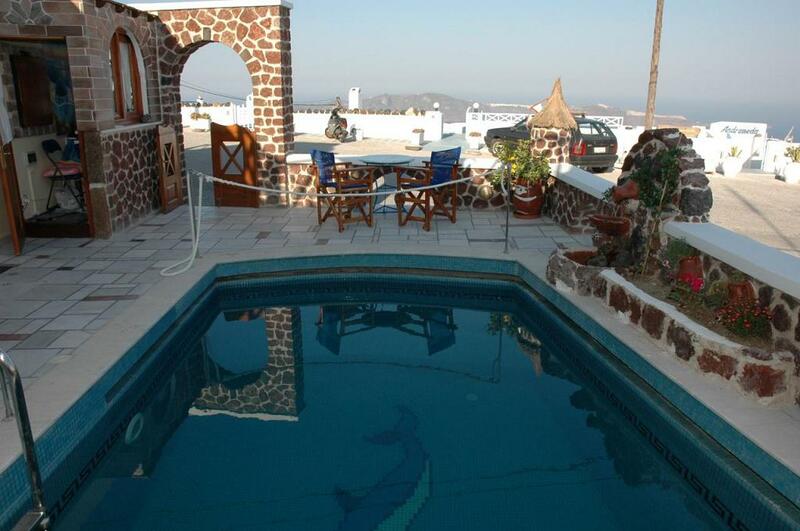 Hotel Atlantida Villas has the best views of all the accommodations in the village of Oia. 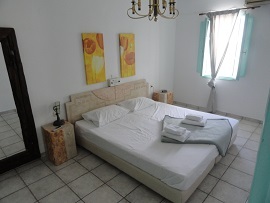 The hotel offers comfortable and enjoyable accommodation, and is considered one of the finest hotels in Santorini. 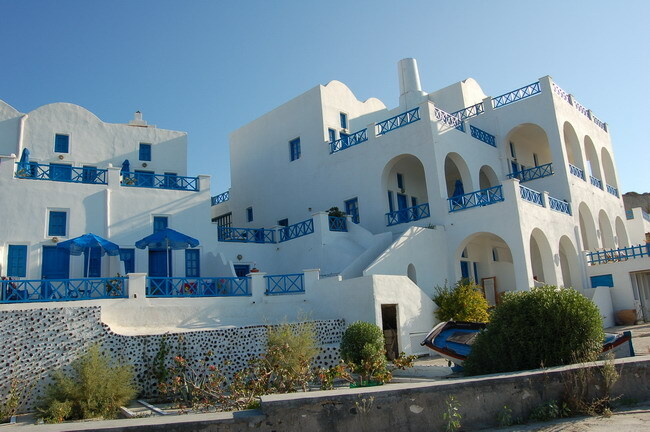 Merovigliosso is situated in the stunning Imerovigli. 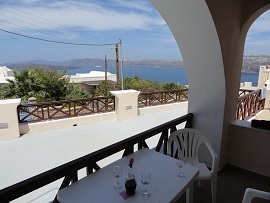 It offers a small swimming pool with sunbathing area and partial views of the Caldera and Aegean Sea. 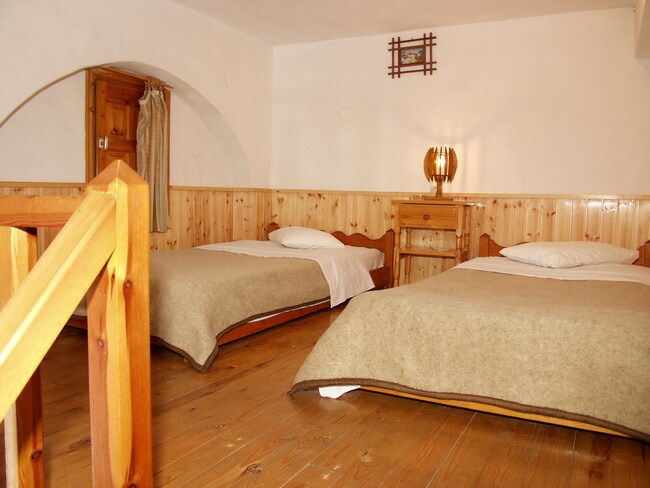 Guest have free access to Wi-Fi. 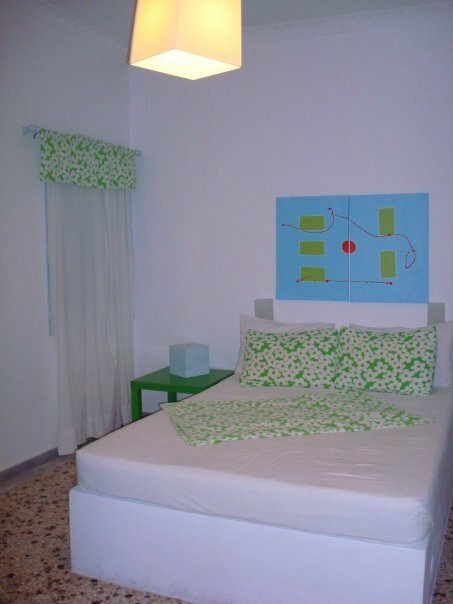 The complex features air-conditioned studios and apartments with sea view balconies. 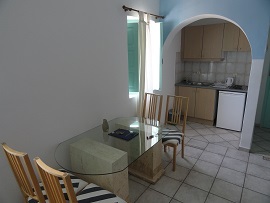 Each has a fully equipped kitchen, including a coffee machine and a fridge. 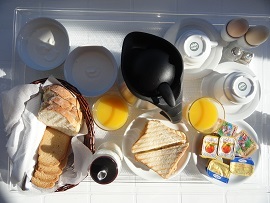 A continental breakfast is included in the price and can be served on your private balcony/veranda. 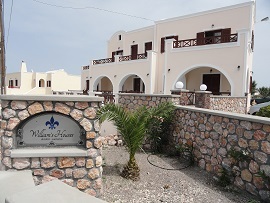 Merovigliosso is close to shops and Santorini's capital, Fira. The bus station is just 150m from the hotel. 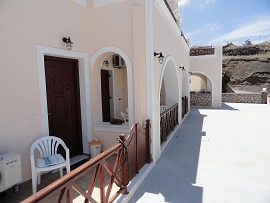 Marizan Villas are situated in the highest spot of Ia, right at the edge of the famous Caldera (cliff), overlooking the sunset and the Aegean Sea from over 200 meters in altitude. The view from the studios is truly beautiful. 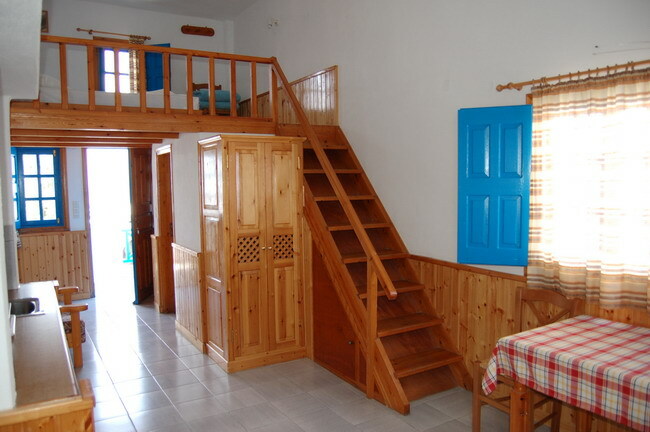 All studios are cave houses on different levels, with balconies. 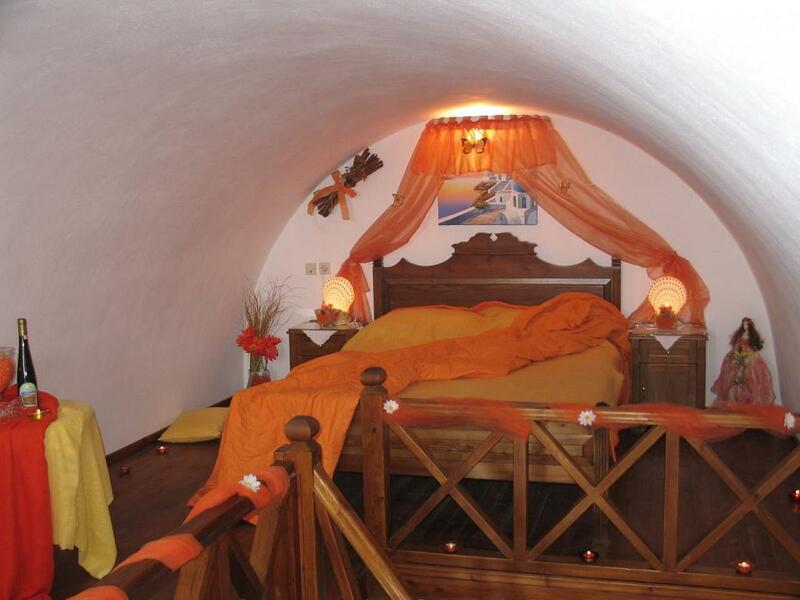 Every cave is a unique accommodation built in the rock, in line with the historic and traditional style of housing in Santorini. 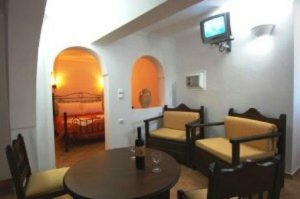 All caves have a magnificent view to the volcano & the Caldera and come with TV, air-conditioning, refrigerator & basic kitchen equipment. 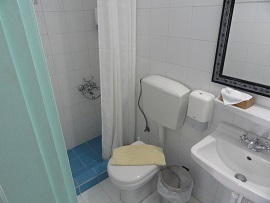 Facilities include breakfast and daily maid service. Spend your day at the veranda and enjoy the view and peacefulness of the scenery. 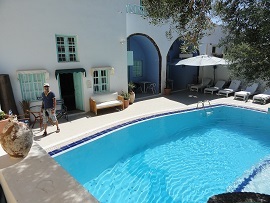 Relax on a sun bed & enjoy the 4 person Jacuzzi available for the guests. 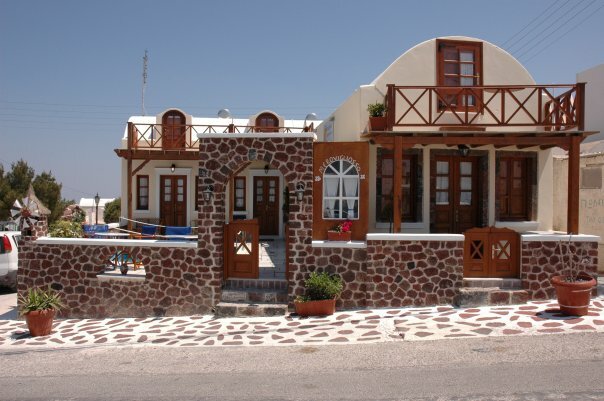 You can walk around the beautiful village, shops and scenery. You will enjoy a 5 minutes walk to the center of Ia. 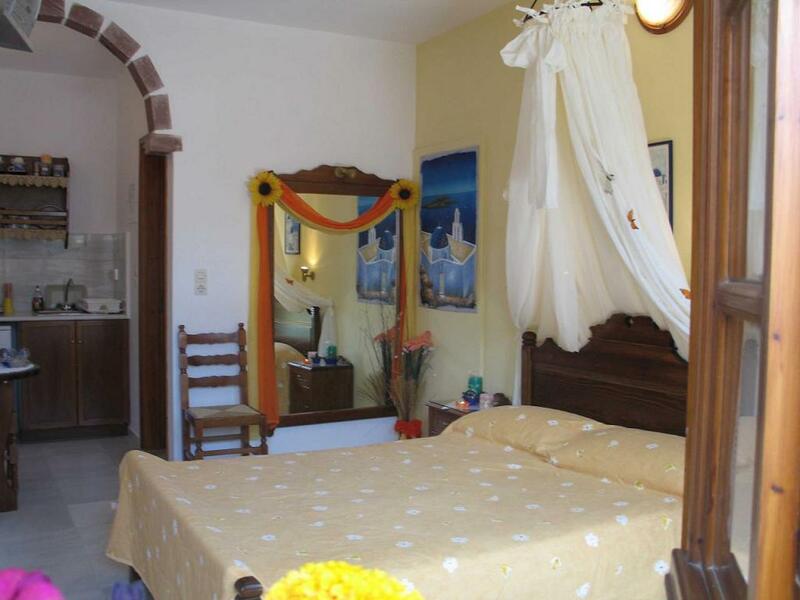 We have the privilege of being in a magical & private position in terms of view and peace of scenery, but also close to the famous restaurants, shops & wine museums.